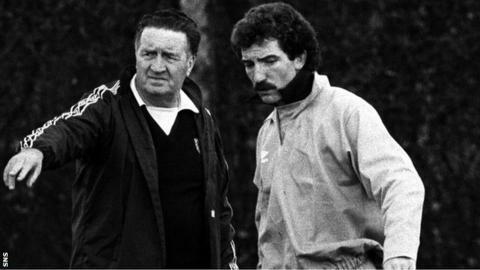 Graeme Souness has paid tribute to Jock Stein, 30 years after the former Celtic and Scotland manager's passing. Souness was captain of the Scotland team during Stein's time in charge of the national team. Stein, the first British manager to win the European Cup with Celtic in 1967, died suddenly shortly after a Scotland match in Wales in 1985. "His knowledge of football was second to none," said Souness. "You just had to listen to him and believe him." Celtic held a ceremony on Thursday to mark the anniversary of Stein's death, with some of his family and members of the Lisbon Lions team that won the European Cup against Inter Milan in attendance. As well as his European achievement, Stein won 24 domestic trophies as Celtic boss, including nine successive league titles. He became Scotland manager in 1978 and led the side to the 1982 World Cup. And it was after an important World Cup qualifier against the Welsh that Stein suffered a heart attack and died. Souness, then at Sampdoria, had been suspended for that 1-1 draw but attended the match at Stein's request. "I was playing in Italy, I had won European Cups at Liverpool," Souness told BBC Scotland. "I was quite a senior player, I had worked with big managers. He was the biggest of all of them. "Me, at that time a 30-plus experienced player fortunate enough to have won a lot of stuff, I hung on every word he said. "When he spoke, I listened. I didn't question anything he ever said to me. "He was extremely tough on me. He was extremely hard on the likes of Kenny [Dalglish] and any of the bigger players, any of the older players, the more experienced players. He was really tough on us. "For some reason, he had a way of delivering that message where you just took it. Nobody ever argued with Jock Stein. When he told you something, you listened. He had a tremendous presence about him. "He was very smart with his mouth, he was very knowledgeable. When he walked into a room, everyone sort of took a breath and waited for him to speak. He was a leader. Whatever he went, people would go with him, unquestionably." And Souness believes Stein is the only one of his former managers who could have managed in today's game. "Jock is the one manager I've worked for where it would be a walk in the park for him today," added the former Rangers and Liverpool manager. "It'd be easy for Jock, he had an intelligence, a street-wise mind that would allow him to operate in the game today. "What he achieved in the game gave him automatic respect. Then on top of that, the way he would deliver that message was very impressive. He would speak with an authority, which very, very few people have."